Assess coder workflow today and know how it may change after ICD-10. Even if your coders’ workflow runs like a well-oiled machine today, you can’t assume that it will continue to be efficient once ICD-10 takes effect. Experts say the new coding system will pose new challenges, and it could also place significant strain on coding productivity if not addressed from a workflow standpoint. Changing a business process can have major implications on workflow, finances, and general operations, says Judy Hanover, research director at IDC Health Insights. Performing a gap analysis (ie, assessing efficiency today to identify areas for future improvement) allows organizations to better understand the factors they must consider to manage the change effectively, she says. Assessing coder workflow isn’t a one-time task, says Heather Haugen, PhD, vice president of research at The Breakaway Group, a Xerox company. Rather, it should be an ongoing process that continually identifies areas for improvement. “It’s rare that we can make these big changes all at once. Changing behaviors takes time, and we’re more likely to make the changes stick if we can do them iteratively,” she says. The sooner hospitals can assess coder workflow, the better, says Stanley Nachimson, principal at Nachimson Advisors. “If hospitals perform their gap analysis early on, they know all the work that needs to be done for the ICD-10 transition, and they can plan for it effectively. They have a lot more time to allocate resources,” he says, adding that hospitals, much like other types of providers, are generally lagging in their gap analyses compared with health plans. The good news is that pushing the ICD-10 deadline back to October 1, 2014, provides hospitals the much-needed time to not only start a gap analysis but also perform a more thorough one, says Pamela Goans, chief operating officer and senior vice president at Precyse. It also affords hospitals the opportunity to address staffing shortages that will likely occur due to attrition as well as evaluate technology solutions, such as remote coding options, that increase the likelihood of finding and retaining qualified staff, she adds. To limit the negative effects of the ICD-10 transition, hospitals should take the following steps to address key aspects of coder workflow. Hanover says insufficient documentation will pose the largest disruption to workflow, particularly as coders familiarize themselves with ICD-10 coding requirements. “The biggest disruption in coder workflow will occur when the information they need just isn’t in the chart or the electronic record, and they need to go back and find the clinician who treated the patient to get more information about the care that was delivered, the diagnosis, or additional information,” she says. The extent to which insufficient documentation will impact coders’ workflow will vary by hospital depending on the coding staff’s clinical and coding knowledge, the electronic tools to which coders have access, and physicians’ overall cooperation and understanding of the requirements, Hanover says. Haugen says it’s helpful for physicians to understand high-level aspects of coders’ workflow so physicians are aware of what happens to the record directly after they document care. Having this understanding could make physicians more sensitive to coders’ needs, she adds. “Sometimes in healthcare we’re in such silos in our own workflows,” Haugen says. However, it’s important to look at documentation from all sources, not only from physicians, Nachimson says. This includes information that registration personnel collect on the front end, such as name, date of birth, insurance information, and reason for admission. It also includes data from outside organizations and entities that furnish prior or concurrent medical information. All these sources should be included in a gap analysis, he says. • Which specialties or departments are most impacted by ICD-10? • What services have your hospital historically performed in each of these specialties or departments? • Of these services, which ones will change the most from a coding standpoint in ICD-10? • Do coders query physicians manually or electronically? • Can coders query directly from the EMR for greater efficiency? • Do coders receive an alert to let them know that physicians have responded to queries? Although it’s helpful to proactively evaluate and improve documentation and the query process, Sadagopan says hospitals must also be prepared for the unfortunate reality that when ICD-10 takes effect, coders simply may not have the information they need to assign a code or they may have questions about how to assign it. Rather than allow queries to skyrocket or productivity to come to a halt, he says some hospitals are establishing a structured escalation process for questions that require coders to first refer to internal resources (eg, frequently asked queries) or use technological tools (eg, computer-assisted coding [CAC]) before approaching physicians or other staff members. Most hospitals have already established a tried-and-true method for assigning work to coders. However, ICD-10 may prompt some HIM directors and coding managers to consider alternatives that can streamline efficiency and productivity, Goans says. For example, assigning work based on a coder’s skill sets can be advantageous because it allows organizations to capitalize on employee strengths. Technology solutions are available that can automatically do this as well as track when certain coders—particularly remote or contract workers—are logged onto the system and available, Goans says. These solutions test coding skills using various patient types and combine this information with data gleaned from previous audits to create a profile for each individual. Then the system automatically routes certain cases (eg, interventional radiology) to the coders who can best handle them according to the information in their profiles. Managers can also do this manually; however, Goans says the task will likely become extremely burdensome in ICD-10. Although most internal auditing occurs retrospectively, Goans says hospitals may want to incorporate prospective auditing earlier in the workflow due to anticipated errors, particularly during the first six months after ICD-10 implementation. Technology can help, particularly in identifying cases that may be at risk of incorrect billing based on a coder’s skill set, the physician, or patient type, she says. “If you have a tool that can do all of these things, that’s going to help offset some of the productivity and get accurate coding so that when you drop the bill, you’re confident that you’ve coded it properly,” Goans says. Even if your documentation is up to par, coders may still be overwhelmed at the sheer number of codes in ICD-10. CAC may help make the list of code choices more manageable, and it may also help boost coder confidence in assigning codes—both of which can have a positive effect on workflow. Aside from CAC, hospitals should also consider other tools that would ease the burden on coders, Hanover says. These include computer-assisted physician documentation to help identify and rectify documentation insufficiencies as clinicians dictate into the EMR and tools that cross-walk codes from ICD-9 to ICD-10 to help coders better understand the translation. • length of time to code particular cases or specialties. Compare the baseline figures with measurements taken after ICD-10 is implemented. In addition to collecting the data, hospitals must also be cognizant of the frequency at which they are collected, Sadagopan says. “These are the standard core measures that are used today, but they need to occur more often, be more proactive, and be performed more systematically. It’s very important to have data on the problem before you try to solve generic kinds of issues. You need to have monitoring and control systems in place that give you reports often—maybe once a week or even more often—that flag any issues related to productivity,” he says, adding that this could include weekly or even daily measurements of coder productivity. In addition to monitoring productivity, Haugen says it’s important to keep tabs on payer rejections, including reasons for denials, as well as how long coders spend reworking those denials. “I think most HIM directors have a sense of the cycle time for getting paid, but what I don’t think we have a good sense of is how often we get it wrong and how much rework it takes to get it right. I’m not sure that very many people are measuring that,” she says, adding that if hospitals can address these problems before ICD-10, it will only enhance workflow after implementation of the new code set. Given the expected decrease in coding productivity, some hospitals are starting to develop relationships with companies that perform contract/temporary coding to maintain a smooth workflow during the transition. “I would expect that this type of elastic staffing planning that is very typical of how IT departments manage their ups and downs in terms of demands for increase in staff will percolate to the HIM side,” Sadagopan says. To accommodate for decreased productivity, some hospitals are choosing to determine in advance how many charts per day an outsourcing company will code, he says. Hanover agrees that hospitals should consider the possibility of having to add more staff once ICD-10 takes effect. “Because there will be a change in the entire code set, we’re probably looking at an increased denial rate. It’s a matter of having increased staff on hand if that denial rate does go up,” she says. Offshore coding is also gaining a lot of traction, in part because many offshore coders have clinical as well as coding backgrounds, Goans says. Hospitals need to look closely at whether information can flow from coders to wherever else it needs to go internally to generate reports or drive data analytics, Hanover says. It’s important to look at how coded data will flow to payers as well, as the efficiency of this process can affect coder workflow on the back end in terms of managing denials, she adds. Hospitals should take the time now to look more closely at the integration of their software systems with those of their payer. If they wait too long, integration costs could rise exponentially, Hanover says. 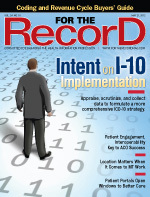 “System integrators will be stretched in terms of staff to work on ICD-10 remediation. Providers who go for help later will find fewer options there and will probably wait longer for service teams or be subject to more expensive pricing from those system integrators,” she notes. Be aware of how ICD-10 may impact other initiatives, such as EHR implementations, and how the two projects combined could affect coder workflow, Nachimson says. This becomes particularly important as hospitals adjust to the ICD-10 delay. Many may find themselves in a different stage of EHR implementation than what they originally anticipated when working with an October 1, 2013, compliance deadline for ICD-10. As a result, he says coders may have access to more electronic documentation and will need to know where to access it in order to correctly assign ICD-10 codes.